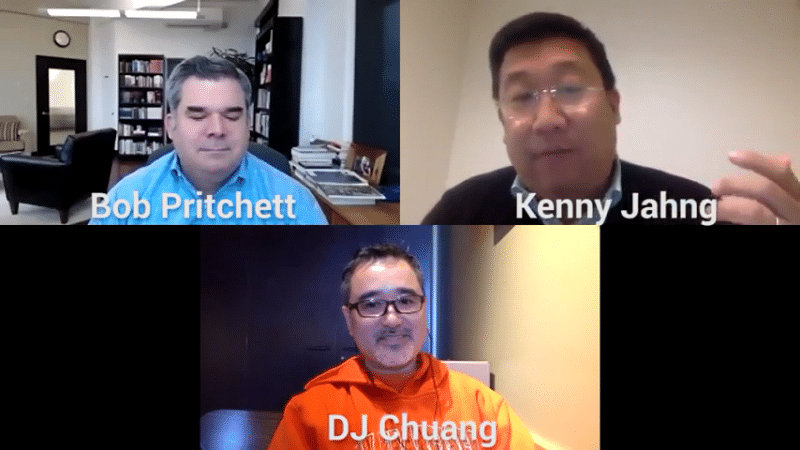 For today’s episode of the Future.Bible Podcast, DJ Chuang and Kenny Jahng sat down with Bob Pritchett, the co-founder of Faithlife Corporation, the makers of one of the most popular Bible software, Logos. Listen as Bob shares about Logos, the popular Bible software. He will share how helpful the software is in Bible reading and learning for the preachers and even church members. Come meet Bob and hear the latest in Bible and technology at BibleTech Conference in Seattle, April 11-12! Kenny Jahng: Welcome everyone to the podcast today. This is the place where Dj Chuang and I have chance to interview leaders, innovators, and entrepreneurs at the intersection of Bible and technology. And I love this show because we get to look ahead, but we also see what’s happening now in the space. Today, I think we’re fortunate to have a leader and innovator and an entrepreneur with us, Bob Pritchett joining us for today’s conversation. Welcome to the show, Bob. Bob Pritchett: Thanks. Glad to be here. Kenny Jahng: Now, Bob, you are the co-founder of FaithlifeC Corporation. You’re the makers of one of the most popular Bible software. And I’m going to, actually, the first question is going to be a long, a long standard question that most people have about that software name. And you serve as the president, CEO there, used to have Bob speaks at industry conferences all the time, to academic groups on entrepreneurship and electronic publishing about digital libraries in the future. Fostering the winner of the Ernst and Young entrepreneur of the year award and one of glass doors, highest rated CEOs and you’ll get a glimpse of why everybody that’s coming out of his teams and organizations are innovators and just have this DNA that I love. So welcome and really looking forward to being with you here today. I’m going to kick off the question with this. It’s almost like the question about G-I-F gifs or gifs. How do you pronounce your software to it? “Lagas”? “Logos”? Tell us once and for all. Bob Pritchett: Everyone and we’ve used different ones at different times for many years. We said “lagas”, but I’m actually trying to say “Logos” more often now because that’s as we go beyond just selling the seminary graduates, we want to be more accessible to the whole church. I joked that I could give a lecture on how not to name a company or product. “Logos” and “lagas” are actually both correct. And really it depends on which school you went to. Some schools use the Erasmian Greek pronunciation, some use a different Greek pronunciation, some people actually prefer to use modern Greek pronunciation. So the great news is we’ll answer to all of them and neither are wrong. Kenny Jahng: Now how long has that software existed? It’s just feels like it’s just one of those things that’s been around almost since Genesis. How long has the software and that have been available as a tool to the community? Bob Pritchett: Yes, we built it for windows in 1991 and it’s actually based on some ideas from a Bible software program I wrote in high school back in 1986. So we’ve been doing this for a long time now. Dj Chuang: Well 1986. That’s like pre internet, pre smartphone. Bob Pritchett: Even our ’91 released was pre internet. We distributed on floppy disks and you know, the five and a quarter inch floppy disks before the little disks existed. So yes, we got our domain name in 1991 when there was no web yet. The web hadn’t been invented, so. Kenny Jahng: Now, today. Right. We’ve talked about pay per click and Facebook ads and social being a very efficient way of getting to people. What was the number one spend in terms of marketing and advertising getting to your customers for Logos back then when this pre internet? Bob Pritchett: It was Christian bookstores, so we sold primarily through christian bookstores and then early on conferences as well. So we do a lot of live conference presentations. We send people out to demo the Bible software or teach Bible study techniques using electronic tools. And we’ve been at hundreds of conferences every year for a very long time. Dj Chuang: That’s amazing. And now we’re in a world where must a lot of people have smartphones, tablets, they have internet connectivity and they’re very active on social media. So what, how has Logos adapted with the times? And then we’ll take a little peek at the future. Bob Pritchett: So one of the things I like best about our platform choices is because we’re pre-internet, what we’ve rewritten the software for many times, and certainly the version we use now was all written in the web era. We’ve learned that many people are not online all the time, right. So it’s easy to think that we’re all on the web all the time, but there’s people who are working on the bus on the way to school or to work. There’s people who are missionaries in countries where they’ve got sporadic internet, there are, you know, rural customers who have, you know, DSL, dial-up, or bad connections. So we are not really cloud based software. We are cloud synchronized software and that’s pretty exciting because it’s actually more powerful and in fact you see a lot of apps that were cloud only actually moving that way. Evernote, it’s kind of that way. Bob Pritchett: It works when you’re offline but when you get on the internet it synchronizes and matches everything up and that cloud synchronization means you don’t have to use the internet to use our platform. But, you know, even if it’s a week before you get back to that internet cafe, you know, after you get back from the mission station in the jungle, it’s still, you know, it connects everything up and synchronizes. So we’re on Windows, Mac, iOS, Android, and the web, and you can use anything, you know, any of our content and any of those platforms, but you can also use it when you’re offline. Kenny Jahng: Other things that are coming down the pike, like right now, all the rage I think is voice, right? Everyone’s looking at voice and seeing that I got a rental car on my last trip and there was Alexa integrated into the car and they’re making waves everywhere else. Right? There’s an Alexa microwave. Alexa clocks, Google and I was just at Costco and the Google assistant is everywhere now. And so, are you looking at other types of interfaces like that or is it always going to be that type of display that needs to be the interface? Bob Pritchett: We’re interested in taking Bible study everywhere our users are. So not only do we have eBooks, we have video at Faithlife TV. We actually have a video Bible that Faithlife TV, which is kind of cool, where you can actually just take the flat screen in your living room and it will, someone will read the Bible over pleasant background music while putting each verse on the screen one at a time and it just runs. You can go through the entire New Testament on, on the screen, and people do that. They just turned it on for hours. We have voice interface, so we have a thing called Faithlife assistant. It’s built into Logos Bible software, and it’s, we’re improving it on both Google home and Alexa. So you can say, “Alexa, ask Faithlife for the verse of the day”, “Alexa, ask Faithlife who was Moses”. It actually can answer questions about thousands of people from the Bible and different facts as well as read scripture to you. Read you the next section from your Bible reading plan. So you could just start the morning with Alexa, ask Faithlife to do my Bible reading and kind of have your Bible reading read to you. Kenny Jahng: And then are you looking at and the machine learning for any of that commentary content or facilitation of study? Bob Pritchett: Absolutely. You know, at one level Bible study is that, you know, it’s about the journey, right? It’s not just the answer, right? The answer could be simple. Jesus loves you and you need to believe, but with the machine learning, we’re not doing the same things that other places are where they’re like trying to extract the answer in the simplest way, right? But we are using machine learning techniques to help you organize the content. We have 130,000 books related to Bible study in our platform and that’s a huge amount of content and more than most people can absorb. So we’ve done lots of automated analysis for everything from you know, Greek linguistic structure to help people, you know, parse the text too. I’m starting to do things like looking into clustering and organizing, right? If I have 85 commentaries on this passage, I don’t have time to read 85 commentaries, but I’d like to read the five commentaries that have the most different viewpoints because I want to see different perspectives. Bob Pritchett: Right? And 10 of them might all agree. So if this machine learning could kind of organize that to say, well these 10 commentary is kind of all take the same position or talking about the same elements and this other commentary, you know, it’s digging into, you know, the, the Greek words or something. So this group is different in its perspective that would make you more efficient in your study by kind of giving you the, you know, the best ones to take a look at. And we are, we have some machine learning experts on staff and some computational linguists and we are exploring how we can use that to enable those kinds of features. Dj Chuang: Wow. That’s so interesting. There seems to be a shift in what people might call Pedagogy in terms of how we learn. Okay. Can you tell us about how you are seeing people learning differently rather than just from the scholars of the past? Perhaps we’re learning from each other through social media and the short attention span. Bob Pritchett: Right? I mean our tool is definitely a popular with people with long attention spans, right? Half of the Logos Bibles over customer spend, you know, 15 hours a week in Bible study, right? The pastor’s sermon preparation, people leading Bible studies and home groups. Right. So we’re a great tool for that. I mean if you want to write a dissertation, you absolutely want to have Logos Bible software to do that with, but I know that so many of us are, you know, are not digging in, right? We don’t have the time to sit and read a book or to go through a course the way that we’d like to and we’re actually getting a huge amount of information through feeds, right? Your Facebook feed, your Linkedin feed, your email is kind of like just an endless feed of things coming in and people are getting stuff in short things. Bob Pritchett: And what I noticed about myself is, you know, myself and my kids, right? My kids are in their early twenties now. They learn a lot from Youtube, right? When they want to learn something, they go and watch a five minute video on Youtube about how to do it. And I’m learning things kind of against my will on Facebook. Right? I’m scrolling through Facebook and then here’s a video about, you know, how we make some part of a car and I get sucked into learning about how electro plating works, right? Or you know, here’s a video about how the electoral college works, or here’s a video about how to, you know, make cheeseburger pie and a crock pot or whatever it is. Right? And those things, we think of them as, you know, the kind of chuff of the internet, but they really, their education, right? Their small bits of learning and education. Bob Pritchett: So what if we get harnessed that that process people are already going through to deliver Bible education and there’s people like the Bible project taking Bible education videos and putting them out there and social media and we’re doing that in Logos as well. And we’re also equipping pastors to share that content intentionally through Faithlife.com. So if you go to Faithlife.com, we’re building out full platform for church management and lots of things for communicating with your church and congregation and all of that stuff. But you can also share Biblical content. It’s super easy to just see something and Logos Bible software and say, I want to share that with my home group or my church or with the public, and that content goes out with a link that takes it back into the Bible software so you can share a verse, share a quote. We make it super easy to make social graphics based on the quotes. Bob Pritchett: I’m right down to if you share a quote from spurgeon in our software, we have premade backgrounds with spurgeon picture in them and it automatically picks the spurgeon graphic when you share a spurgeon quote. Right? And we do that for hundreds of authors and lots of books so it for a cool social media graphic. But then if they click on that to go beyond the quote, you can take them back to the book and back to the source. And then with the media and we put it in the Bible software like we have, you know, a four or five minute background on the archeology of emphasis. Right? And when a pastor’s preparing a sermon in Ephesians Logos, Bible software will bring up this video in Ephesus. And the pastor may watch that and find it helpful, but not every pastor is going to take four or five minutes out of the sermon time on Sunday to show this background video and Ephesus. Bob Pritchett: But it’d be cool if you could. The congregation had access. So we’re building features into the Bible software. The pastor can say as they’re preparing a sermon, this was useful to me. I liked this video in Ephesus and “ooh, I like this quote that Martin Luther said about it. It doesn’t fit my sermon, but it’s really good” and “I really liked this particular commentary on the passage”, and that content that gets shared to the church’s faith life group and the congregation during the week when they’re checking the calendar or coming in to say, yes, “I’m going to volunteer to be in the nursery this weekend, or whatever”. That social feed has that content that the pastor has shared intentionally. So the pastor’s going to preach on Ephesians this weekend, but you watched the archaeology video and Ephesus and you know, watch the little video segment from one of the courses that he looked at on the background in Ephesians and all of this way of kind of drawing people in. Bob Pritchett: And if we try to make it too heavy weight or to intentional, right, it’s like, “are you ready to sign up or a 12 hour course on Ephesians?” “No, that’s too much for me right now. I’m too busy.” But when you’re looking at that feed at or even looking at, you know, you’re going through Facebook and your pastor is shared video on, you know, the cool archaeological remains in Ephesus, well you get sucked into that, right? You end up watching that while you’re waiting for your wife to come at a Target or whatever it is. And that’s what we want to do is we want to redeem all those little moments, to get people engaged with the Bible. And I think that’s a way that we can take advantage of what we might easily see as a negative. About the kind of the transients of social media and say, how do we redeem those little moments and take them the other direction. Can I engage you with scripture or education in that time? Dj Chuang: That’s wonderful to hear that Logos and Faithlife are really keeping up with how people are engaging with content and Bible learning. So a Logos sounds like it has quite a rich and depth of history with a scholarly study of the Bible. And then now you’re also developing this community through Faithlife to engage non scholars and communities around churches, engage the Bible and you’re using the latest technologies. And as a CEO, what is your vision for Faithlife, you know, three to five years down the road? Bob Pritchett: We’re really excited about building a platform that churches use to equip their congregations to grow in the light of the Bible. That’s really, that’s our mission statement. We use technology, equip the church to grow in the light of the Bible. and so even as we build out church management tools and we have presentation software and social network and member management giving and website hosting, all of those things, we’re connecting them all back to scripture, right? So the goal of engaging the church isn’t just a pack, the gymnasium or to get the youth group there, right? Is to get people connected to god’s word and, and into it. So we’re bringing that filter to everything we do, right? We’ve got features coming up. It’s like how do we connect children’s check in to getting parents to talk to their children about scripture, right? And because we have such a massive content library and so many tools for Bible study, it’s really equipping us well to do that. Kenny Jahng: We don’t have time to expand this big question, but I’ll ask this one high level question. What is the church doing right or wrong in terms of getting their people to read or engage with the Bible on a regular basis? It seems like culture has competitively taken away the attention of the Pewsitter. Even physically not being able to you know, the average church goer isn’t going four times a month anymore, right? There are going two to three times a month and then we know that they’re not reading the Bible every single day or even every week, and then they’re not even holding their Bible to even find their Bible in their house to bring it to church there. They’re relying on what’s in their pocket. From your perspective because you are, your job, I guess from an everyday basis is trying to figure out how do we get our people to engage, engage, interact, and interact because your products and services don’t work if you don’t get the attention span and stuff like that. What’s the one thing on the local church level that you wish was consistent or had more emphasis in that front, are they missing the class? Are they missing expository teaching from the pulpit? What are they missing right now? Bob Pritchett: You know, I think it’s different at every church to some churches are doing this really well. Some are doing it poorly. There’s a huge diversity of what’s going on. I think that we are in a world in general were you know, the Sunday school classes disappeared, you know, the midweek Bible study may have gone disappeared. You’re right. People aren’t a church for weeks every month. So, and some churches are, you know, kind of preaching to the new visitors every week, right? So what we’re trying to do is remove the friction, right? People are, we’re more and more used to convenience. We’re used to instantaneous things. What we’re interested in getting answers as soon as we pull the phone out of our pocket. So we’re just trying to adapt that world. and what we want to do is equip the church to do that. Like there’s other people doing this out on the internet, but people have a certain trust relationship. Bob Pritchett: If you’ve chosen to associate with his church, then you tend to listen to that pastor. You tend to look at communications that come from that church and it’s going to kind of get through your filter more easily than something just coming in in general. So we’re trying to equip every pastor of a 200 person church is not a social media expert, right? They may not know how to put together a social calendar of media posting and had you know, what content is most shareable and consumable online. But we can help them and say, “okay, you’re preaching on this topic, here’s social media that you can share through your channels that where it’s highly likely to get the attention of your congregation of the people you minister to and it’s designed to fit them where they are.” We’ve shot hundreds of seminary level courses with some of the best professors in the world and we sell those courses to people who are wanting to get seminary level education. Bob Pritchett: But we intentionally shot those courses in 5 to 12 minute segments instead of 45 minute lectures because who sits down and watches a 45 minute lecture anymore. Right? But by letting the professors do what they call natural length segments of, you know, the little pieces of the lecture, you can sit and watch it for 45 minutes or 10 hours in a row. But with a five minute segment, I can share that and have more chance that you’re going to watch it. Right? And then I could say, “oh, you like that, what’s the next one? It’s only a three more minute commitment”. Right? So taking advantage of how people really work in this very frenetic world of information consumption. Dj Chuang: Wow. That’s amazing things that you’re thinking about the fairing. One last question. You have magic wand and could wave it and make a wish, what would you love to see in the world? That Bible and technology? Bob Pritchett: I would love to see this stuff get adopted, right? I would like to see people connected to their community, to their church community digitally. Right? I think what’s happened is we’ve lost some of that. I show up at church three times a week, community and we’ve replaced it in some cases with more of a consumer culture. Right? I go to church, I sit in the pews, they deliver information to me, and then I don’t think about it again until next Sunday or two Sundays from now when I come back. Right? so we want to see, I want to see these digital tools not only help reinforce that community because digital communities, while digital means are the same as authentic real life ones, if you have one backing up your real life, one, you can build tighter connections and better relationships and then if we can use that to help people get that Bible education and pique their curiosity and draw them in, that’s what I’m excited about is making that connection happen. Dj Chuang: Well, thank you Bob. After listening to today’s conversation, if someone wanted to reach out to you directly, what’s the best way they can get in touch with you? Bob Pritchett: Email is great bob@faithlife.com. And I’m on Twitter @bobpritchett. Dj Chuang: Well, thank you so much, Bob Pritchett, for dropping by to share about all the exciting things we’re doing and what you’re thinking about with tech and Bible and its adoption by many more for treaters. I hope we get a chance to visit again and thank you for an amazing conversation. Bob Pritchett: Thanks. It was great being with you guys. 05:00 we are not really cloud based software. We are cloud synchronized software and that’s pretty exciting because it’s actually more powerful and in fact you see a lot of apps that were cloud only actually moving that way. Evernote, it’s kind of that way. It works when you’re offline but when you get on the internet it synchronizes and matches everything up and that cloud synchronization means you don’t have to use the internet to use our platform. 07:49 the machine learning, we’re not doing the same things that other places are where they’re like trying to extract the answer in the simplest way, right? But we are using machine learning techniques to help you organize the content. 12:54 That social feed has that content that the pastor has shared intentionally. So the pastor’s going to preach on Ephesians this weekend, but you watched the archaeology video and Ephesus and you know, watch the little video segment from one of the courses that he looked at on the background in Ephesians and all of this way of kind of drawing people in. 13:41 And that’s what we want to do is we want to redeem all those little moments, to get people engaged with the Bible. And I think that’s a way that we can take advantage of what we might easily see as a negative. About the kind of the transients of social media and say, how do we redeem those little moments and take them the other direction. Can I engage you with scripture or education in that time? 14:50 We use technology, equip the church to grow in the light of the Bible. and so even as we build out church management tools and we have presentation software and social network and member management giving and website hosting, all of those things, we’re connecting them all back to scripture, right? So the goal of engaging the church isn’t just a pack, the gymnasium or to get the youth group there, right? Is to get people connected to god’s word and, and into it. So we’re bringing that filter to everything we do, right? We’ve got features coming up. It’s like how do we connect children’s check in to getting parents to talk to their children about scripture, right? And because we have such a massive content library and so many tools for Bible study, it’s really equipping us well to do that. 18:06 remove the friction, right? People are, we’re more and more used to convenience. We’re used to instantaneous things. What we’re interested in getting answers as soon as we pull the phone out of our pocket. So we’re just trying to adapt that world. and what we want to do is equip the church to do that.